There are some beers I just have to try . . . usually a trip to the beer store will satisfy a want and sometimes it's pretty hard to get my hands on a bottle. A west coast beer I've wanted to try for a while is from a small brewery that sells to a limited distribution area . . . luckily Marina Market in Poulsbo, WA is willing to ship beer and other stuff to wherever (for a price). Monks Indiscretion from Sound Brewery is that beer. It was recommended by a fellow beer lover and was pretty high on my list of beers to try. I'm glad I made the effort . . . it was well worth it. Monks Indiscretion pours a lush golden yellow with a light frothy head. The beer smells intense and strong . . . there is much promise to the aroma but can the beer deliver? Oh yes . . . yes, it can! First of all, it is indeed strong with a 10% ABV. There are a lot of complex flavors mingling together . . . it tastes tart fruity with yeasty undertones and a bitter hop finish. It has a boozy quality that makes it almost brandy-ish. Monks Indiscretion is a sipping beer, something to be savored and enjoyed. I think it would pair well with simple plate of fruit and cheese or a big honkin' steak. This is one of those beers I didn't want to have to share, but hubby was sitting right there and it would've been quite rude . . . not to mention detrimental to marital bliss . . . not to pour him a glass. Monks Indiscretion met and exceeded my expectations. It is truly a remarkable and enjoyable brew . . . really quite amazing. Visit Sound Brewing's website or check them out on Facebook. 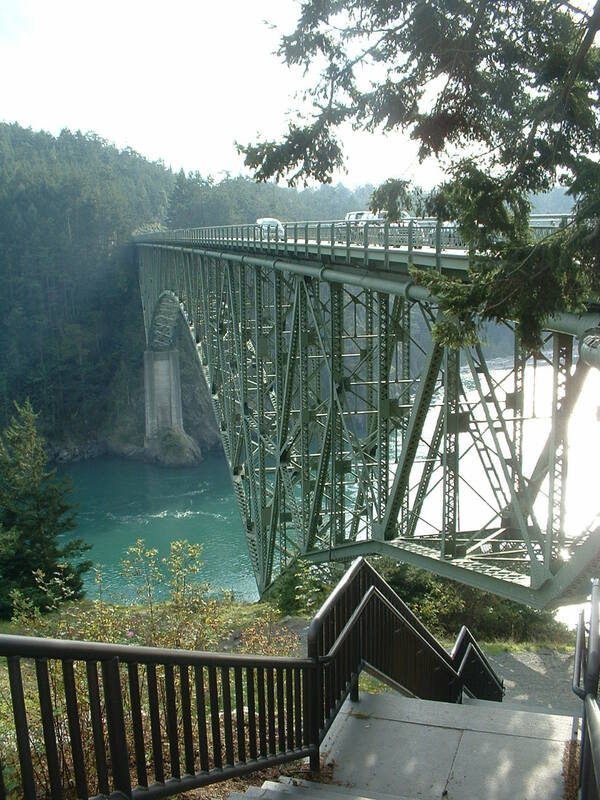 A view of Deception Pass near the Sound from a visit a few years ago . . . a beautiful place to visit. Check out Sound Brewery if you're every in the area.